Scientists and engineers demonstrate the outpost-sized hydrogen reduction process that could produce oxygen from lunar soil. NASA has long planned to mine water on the moon to supply human coloniesand future space exploration. Now the discovery of small amounts of wateracross much of the lunar surface has shifted that vision into fast-forward, withthe U.S. space agency pursuing several promising technologies. A hydrogen reduction plant and lunar rover prospectors have alreadypassed field tests on Hawaii's volcanic soil, and more radical microwavetechnology has shown that it may be used to extract undergroundwater ice. Water mined by these methods could not only keep astronautssupplied with a drink, but may also provide oxygen and fuel for lunar missions. "You can make back costs fairly quickly compared to the launch costsof just throwing tanks of water and oxygen at the moon," said GeraldSanders, manager of NASA's In-Situ Resource Utilization Project. He pointed toa cost-analysis study conducted by the NASA Ames Research Center in California that suggested such extraction technologies could pay for themselves within ayear. Still, Sanders cautioned that big unknowns must be conquered before NASAengineers can go prospecting for lunar water. They need to know howmuch water the moon holds, where it is, and how deep they have to excavate. One probe, NASA?s LCROSS spacecraft, is closing in on the moon?s southpole and is expected to crash into a crater on Oct. 9 in another bid to findwater ice hidden within the permanent shadows there. NASA scientists have quietly worked on water mining technologies foryears in small laboratories. But a full-blown program did not emerge until thelatest vision for living off the land and using lunar resources emerged in2004. One promising technology takes advantage of the chemistry of the moondirt - or regolith - by adding hydrogen, which then reacts with iron oxide inthe moon dirt to produce water. Such hydrogen reduction reactors heat theregolith to about 1,832 degrees Fahrenheit (1,000 degrees Celsius) so that theproper chemical reactions can occur. A process known as electrolysis can then split the extracted water intopure hydrogen and oxygen, either for rocket fuel or astronaut air supplies. NASA has already tested a hydrogen reduction reactor on Hawaii's MaunaKea Volcano. During a year-long operation, it produced 1,455 pounds (660 kg) ofoxygen from a rocky soil containing 5 percent iron oxide. Now engineers have asecond-generation system in the works that can produce 2,205 pounds (1,000 kg). Several different roversand mining drills have also cut their teeth in Hawaiian field tests, anddemonstrated how future missions could excavate water from lunar regolith orunderground ice pockets. "You basically have a small chamber on a rover, and the rover scoopsregolith into the heating chamber," Sanders told SPACE.com. Hecompared it to the oven technology previously used on NASA's Phoenix MarsLander, except that the Phoenix oven represented a one-time use device. A reusablelunar reactor would require airtight valves that could open and close over manytimes over several years. But engineers remain unsure about whether to dig up material and bringit back to a central processing plant, or if rovers should simply carry theprocessing technology. One serious consideration comes from whether weakly heldwater in the regolith might get lost during lunar excavations, researcherssaid. Beyond ovens, NASA has also looked at microwaves to mine moon water. Tests on simulatedlunar permafrost have shown that beamedmicrowaves can vaporize 98 percent of water ice, and capture 99 percent ofthe extracted water in gas form - all without the need for drilling or diggingin frigid conditions where water ice might become as solid as granite. Microwave technology remains in its infancy, but could have"significant energy savings" compared to digging up and heating hugemasses of regolith, Sanders said. 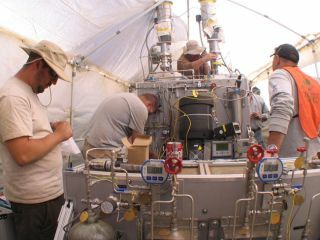 Testing such technology is expensive, even in Earth laboratories. Butcomputer modeling has helped calculate how different microwaves get absorbed bydifferent types of lunar regolith, said Edwin Ethridge, a materials scientistat NASA's Marshall Space Flight Center at Huntsville, Ala.
"We don't know the ideal microwave frequencies necessarily,"Ethridge explained. "It depends on where the water is and how concentratedit is." The amount of iron within lunar regolith also changes how muchmicrowaves get absorbed, and it's not the same across the moon's surface.Apollo astronauts brought back samples from the lunar plains, but NASAscientists suspect that much water ice could lie hidden within the highlandsand regions near the lunar poles. Ethridge and his colleagues hope to eventually get their hands on morereal lunar samples. But for now they have several variants of simulated lunardirt that represent different parts of the moon. Whatever the method, water-mining technology may prove ready sooner thanNASA can return to the moon. The agency hopes to send astronauts back to themoon by the 2020s, but uncertainty over the manned Constellation program andthe agency's future weighs heavily on the funding for these efforts, and how soonthey might deploy. Much also hinges on the fast-approaching LCROSS mission that aims to crashinto the moon with two impactors. That could tell scientists how much morewater ice lies hidden within craters near the lunar poles, and help fill insome of the unknowns. "The first step in all of this is basically to understand theconcentrations of [available] water, how much energy it takes to dig up, and howmuch energy is required to drive off volatiles," Sanders said. Budgetary and scientific uncertainties aside, both Sanders and Ethridge remainconfident that extracting water from the moon represents a winning path forNASA. "I don't see how it could not be cost-effective to extract water fromthe moon to refuel space payloads in lunar orbit," Ethridge noted. "Ifwe have a lunar outpost with humans, the most logical thing would be having afacility to extract water." Such technologies should serve NASA well beyond the moon as well. Freshimpact craters on Mars have revealed ice beneath the red planet's surface - atantalizing hint of what humans hope to find closer to home. POLL: The Moon or Mars, Where to Go First?